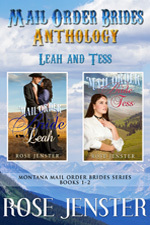 Mail Order Brides Anthology: Leah and Tess contains the first two books of the series in one volume. The stories can be read alone as each is independent. The courage it took for each of them to leave New York and the security they had was remarkable. What gave them the motivation? You can pick it up at a special price at Amazon HERE . Also, it is in Kindle Unlimited, so you can get a free trial and see how you like it and read books this summer! It’s a wonderful program and lots of awesome books are available this way. I’m also working on the story of May (Jane’s sister) who became a mail order bride and inspired both Leah and Tess! This will be out some part of this summer. The series has six books already so you can find some sweet stories to get uplifted this summer. They are all in Kindle Unlimited. You can see the books you may have missed on my author page at Amazon. I hope everyone is having an awesome summer too and be safe. NOTE: Books 3-6 (Felicity, Frank, Verity and Jessica) are all now bundled into a boxset too. So if you are heading on a vacation or want to have some of the sweet stories together in a boxset, you can pick them up at a special price at Amazon HERE . Remember you can read them on a phone, tablet or computer and no kindle is required. You can also get a free trial for 30 days of kindle unlimited as all the books and the boxsets are in kindle Unlimited so can read them for free that way too! So beautiful. I am retired and these two stories gave me so much happiness. Look forward to rest of series. So nice that there are still some beautiful stories without vampires or creepy things! I love LOVE!! I’m happy you can read these stories during your retirement. And I too do not like reading about vampires, ghosts and anything that makes me duck@! I like happy endings but with depth in the characters. Thank you for your kind words and I hope they were happy tears! PS A new book should be out at end of July or early August… it’s about May who is the sister of Leah’s sister-in-law (Jane). Jane writes a letter to a man out west pretending to be May! I am generally not an emotional person, but Rose these two stories were so beautiful. They made me cry! There was such happiness for them after their struggles. Thank you for writing these Rose.